DONETSK, Ukraine -- Driven out of their key stronghold in eastern Ukraine, pro-Russia separatists regrouped Sunday in the city of Donetsk, vowing to renew their fight against the government in Kiev before thousands of cheering supporters at a rally. 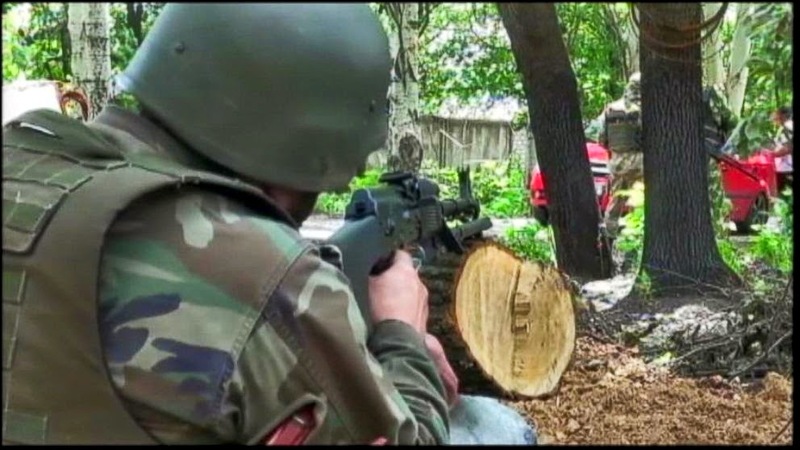 Ukrainian troops on Saturday forced the rebels out of Slavyansk, a city of about 100,000 that had been the center of the fighting. The government's success there suggested it may finally be making gains in the months-long battle against the insurgency. President Petro Poroshenko said, while it was not a total victory, purging Slavyansk of the armed insurgents had "incredible symbolic importance." Rebel fighters from Slavyansk and other towns taken over by the Ukrainian army moved freely Sunday around central Donetsk, a city of 1 million and the capital of a region where the separatists have declared independence in the name of the Donetsk People's Republic. 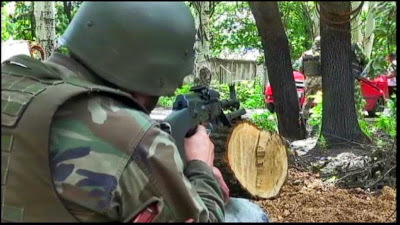 The insurgents control the regional administration building and checkpoints on the city outskirts, but Ukrainian forces demonstrated their superior firepower in repelling a rebel attempt to take control of Donetsk airport in late May. That battle left dozens of rebel fighters dead. Igor Girkin, the self-appointed defense minister of the separatist republic, told the Russian television channel Life News on Sunday that he would keep up the fight from Donetsk. "We will continue the combat operations and will try not to make the same mistakes that we made in the past," said Girkin, a Russian also known by his nom de guerre, Igor Strelkov. Ukrainian authorities have identified him as a veteran of the Russian military intelligence agency. At the rally Sunday afternoon on a square in Donetsk, people waved flags from Russia and the Donetsk People's Republic. "We will begin a real partisan war around the whole perimeter of Donetsk," Pavel Gubarev, the self-described governor of the Donetsk People's Republic, told the crowd. "We will drown these wretches in blood." They were forced to flee Slavyansk because several commanders had betrayed Girkin and left his forces vulnerable to attack, Gubarev said. "We will fight to the end because we have nowhere left to retreat," said one of the masked fighters, a 32-year-old former coal miner who would give only his first name, Artyom, due to fears of retaliation. "I don't want to fall into the hands of the Ukrainian authorities, those fascists." He said the insurgents still hope for help from Russia "but the hope grows weaker with every day." Ukraine and the West have accused Russia of fomenting the insurgency by sending troops and weapons, including tanks and rocket launchers. Moscow has denied providing soldiers or military equipment, saying that Russians fighting in the east are private citizens. The insurgents have shot down Ukrainian aircraft, but the military has a clear superiority in firepower. Rebel leaders have pleaded with the Kremlin for military assistance, and some prominent Russian nationalists have taunted President Vladimir Putin for failing to send troops to the Russian-speaking area. Putin has so far resisted, wary of having more Western sanctions slapped on Russia. "We are afraid that Donetsk will be left in ruins like Slavyansk," she said. "The rebels have brought us war and fear." Pro-Russia insurgents also have been fighting Ukrainian troops in the neighboring Luhansk region, which, like Donetsk, sits along the border with Russia. The insurgency began in mid-April after the ouster of Ukraine's pro-Moscow president in February and Russia's annexation of Crimea in March. Quote: "В 2012-2013 годах практически не рос ВВП ни в странах Евросоюза, ни в России – а ведь на ЕС и Россию приходится более 50% всего украинского экспорта. Цены на основные экспортные товары – черный металл, сельскохозяйственные удобрения, зерно, продукцию машиностроения – практически не росли. Вдобавок и торгова война, которую Россия устроила с Украиной минувшим летом, ограничив импорт значительного количества нашей продукции, никак не способствовала росту. В этих условиях было ясно, что наши зарубежные торговые партнеры нам никак не помогут. У экономики оставался только одна возможность для роста – за счет внутреннего спроса, то есть покупок самих украинцев. Но выполнение требований МВФ, то есть повышение цен на газ, тарифов на коммунальные услуги, да еще и девальвация гривны, привели бы к обнищанию населения, объяснял Арбузов. «Я считаю, что именно стимулирование внутреннего спроса способно обеспечить устойчивое развитие экономики. Должны вырасти накопления, которые затем станут основой внутренних инвестиций в развитие страны. То, что предлагает МВФ, ведет к сокращению и потребления, и накопления людей», – рассказывал он в интервью деловой газете «Капитал». Кабмин, однако, пытался найти общий язык с МВФ, чтобы избежать реализации столь разрушительных мер. Украинская делегация предлагала фонду санировать НАК «Нафтогаз Украины», после чего аккуратно и поэтапно начать выполнять эти рекомендации, вспоминает Арбузов. Правительство хотело так сделать эту работу, чтобы это не привело к сокращению свободных доходов украинцев, особенно малоимущих, для чего планировало создать систему адресных компенсаций для малообеспеченных слоев населения. Однако этот вариант фондом был отвергнут, говорит Арбузов. А затем к власти пришло правительство Яценюка, и новый премьер заявил, что Украина выполнит абсолютно все требования МВФ." Above Mr.Arbuzov making statements which are not correct or direct lie. For example: news agencies in the West explained the IMF position on low income population in Ukraine, where IMF proposed after increase of gas prices for population, low income people should receive money back from Yanukovych/Azarov's ex-government. At the same time Azarov's ex-government never explained IMF position to the people, instead Mr.Arbuzov claiming that proposal to compensate low income population for the gas price increase was Azarov's ex-government proposal which is a lie, according to the news agencies in the West. Above Mr.Arbuzov's explanation about export decline and impoverishment of population has truce in it but, he failed to mention that at the time when Mr.Arbuzov himself was part of a government, that government failed to implement projects which could create jobs and increase local demand for main export products. One of such projects could off been construction of modern road system which demands allot of metal and other materials, plus it would of increase people's income by providing higher paying jobs. My conclusion is that, Mr.Arbuzov, when he portrays himself as a wise man; he should use examples of his personal achievements not the areas where nothing has being done.